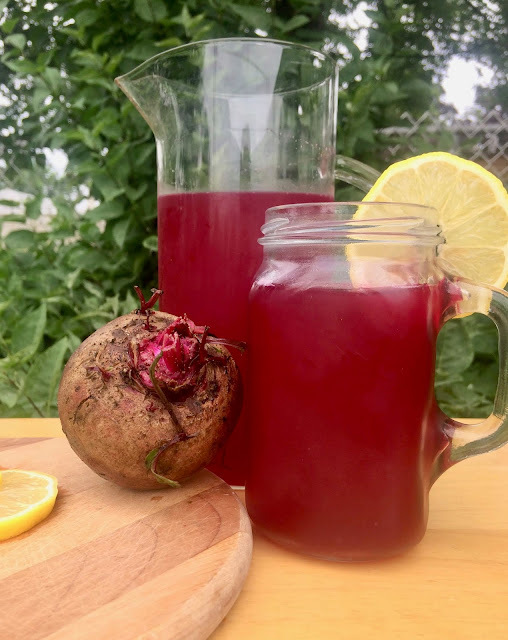 Sweet, tart, and a little earthy, beet lemonade is a delicious and different drink for a hot summer day! 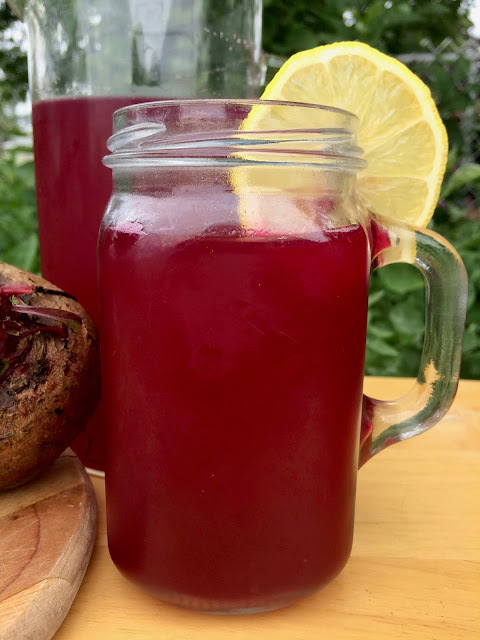 I had beet lemonade out at a restaurant last year and have been wanting to recreate it at home ever since. I was waiting for #CookoutWeek because I knew it would fit in perfectly with all the summery cookout, grilling, and picnic recipes. While this drink was new to me, there are recipes on the internet already (like everything!) so I read a bunch of them and played around until I got the flavor I wanted. You can adjust it very easily by adding more or less sugar, more or less beet, and more or less lemon juice, and also with more or less water. I like to use less water because I really enjoy the flavors, but you can dilute it more if you want. You can also top it off with a bit of sparkling water for some bubbles (or maybe even a splash of vodka). It's all up to you and your taste buds. This refreshing drink recipe will make about 6-8 servings. And, as always when working with beets, remember that they can and will stain! In a food processor with the shredding blade, shred the beet. You want to end up with about 1 lightly packed cup of shredded beets. Remove the shredding blade and put in the regular food processor blade. Blend together the beets, lemon juice, sugar, and 1 cup of water until smooth. Pour the mixture into a fine mesh sieve over a large glass measuring cup (or bowl). Use a spoon to push out as much of the liquid as you can. You should have about 2 cups of liquid. Pour the liquid into your serving pitcher and then add cold water until you reach your taste preference. Don't forget to check all all the other #CookoutWeek recipes for today below and also head over to enter the AMAZING GIVEAWAY of over $750 of cookout gear and food. Wow, the color is beautiful! What a fun twist! What a beautiful color and made naturally. Gorgeous color and I absolutely love beet lemonade. Hi Amy, since its the cookout week at savory moments, I brought Moroccan chicken drumsticks to the party. #CookoutWeek is only for bloggers participating in the sponsored event. So versatile...I love when you can make a recipe your own! This is one I NEED TO TRY!!! I'd never heard of beet lemonade before, but now it's on my list of drinks to try. Thanks so much for sharing this over at First Monday Favorites. Looks like a great recipe. 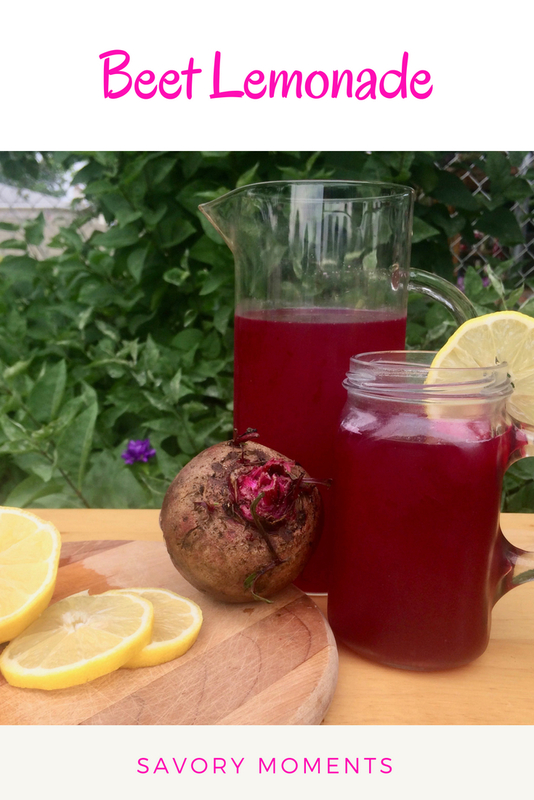 Beets always give me energy, and I bet the lemon adds a lot of flavor! Thanks for sharing on Foodie Friday! How interesting! We have a ton of beets that need pulled so this would be fun to try. I love the color! This is such a wonderfully unique recipe! What a cool way to use beets.